On the Shabbat preceding the Exodus, the Jews tied lambs to their beds in preparation for the Passover sacrifice. When the Egyptians asked about this, they were told that G‑d would bring about the final plague of the firstborn. The Egyptian firstborn panicked and, fearing for their lives, asked Pharaoh to finally let the Jews go. When Pharaoh refused, a civil war broke out between Pharaoh and the firstborns, causing many Egyptians to die even before the final plague struck. On the Shabbat preceding Passover, we celebrate this miracle. It is a widespread custom among Jews to read the bulk of the Haggadah on the afternoon of Shabbat HaGadol. We start from Avadim Hayinu, right after Ma Nishtana, and read until Lechaper Al Kol Avonoteinu, at the end of Dayeinu and Al Achat Kamah VeChamah. We check for any last bits of Chametz around the house on Thursday evening, April 18. The checking is done with a feather, wooden spoon and a candle. Care should be taken to check the entire house, not merely to pick up the traditional ten pieces of bread. The first Kol Chamirah (printed in most Haggadahs) is said after Bedikat Chametz. It states that any unknown Chametz is null and void. Saying this Kol Chamirah is a key part of the Mitzvah of Biur (getting rid of) Chametz. Any remaining Chametz that will be eaten on Friday morning should be placed in a secure place where children cannot easily get to it and spread Chametz around the house. The bedikah is done after nightfall, at 8:08 PM. It is customary for all firstborn males (and fathers of first born males who are below Bar Mitzvah) to participate in a Siyum, celebrating the completion of a tractate of the Talmud, so that fasting will not be necessary. Until one hears a Siyum, a firstborn should not eat beginning at dawn, 4:38 AM. One must complete eating all Chometz before 10:39 AM on Friday, April 19. The Chometz does not have to be burned for another (halachic) hour. See next paragraph. The chometz that was found during Bedikat Chametz should be burned Friday morning, April 19, before the fifth hour of the day has passed (before 11:47 AM). The second Kol Chamirah (printed in most Haggadahs) is said after Biur Chametz. It declares that all Chametz – whether known or unknown - is null and void. In addition, by this time, any cabinets or cupboards containing Chometz that will be sold to a non-Jew by the Rabbi, must be closed and sealed. · We should make every effort to make sure that our families and friends have handmade Shmurah Matzah for (at least) the seder nights. · It is suggested that chaorset and horseradish should be made for both seder nights before Passover begins. The ground horseradish should be stored in an airtight container. · The best way to fulfill the Mitzvah of eating Maror is with Romaine lettuce, which unfortunately is often infested with insects. It is suggested that one buy special bug-free lettuce. · If one wishes to use horseradish in addition to romaine lettuce, the horseradish must be ground. Prepared horseradish with vinegar and other additional ingredients is not acceptable. Buy a fresh horseradish root and grind it in a food processor before Pesach begins. · Roast the shankbone (depending on your custom, this can be a chicken neck or wing) on Erev Pesach. · One must be careful not to start the Seder until after nightfall. The first Seder on Friday night, April 19 should not start until 8:09 PM. The second Seder on Saturday night, April 20, should not begin until 8:24 PM. · Men lean to their left when doing the following Mitzvahs at the seder: while drinking the four cups, while eating the first Matzah, the Korech and the Afikomen. · When saying Hamotzie on the Matzah at the Seder, we hold on to all three Matzahs, the top and bottom whole ones as well as the broken middle Matzah. Then, for the next Bracha of “Al Achilat Matzah,” we drop the lower Matzah, which will be used for the Korech sandwich, and hold the top and middle Matzah for that Brachah. When we eat Matzah for the first time, we take some of the middle Matzah and some of the top and eat from both of them together. · Ideally, try to eat at least 1/3 of a whole Shmurah Matzah for the first eating of Matzah as well as the Afikomen. For the Korech sandwich, 1/4 of a Shmurah Matzah suffices. · It is the Chabad custom to endeavor to eat the Afikomen of the first Seder before midnight, 12:54 AM. · Don’t forget about the morning Shema. No matter how tired one may be, care must be taken to say the morning Shema in the correct time. The latest time for Shema on the first days of Pesach is 9:29 AM. · We begin saying Morid HaTal at Mussaf on the first day of Pesach, Shabbat, April 20. We say VeTein Brachah in the 9th Brachah of Shemoneh Esrei, beginning with Ma’ariv on the Motzaei Yom Tov, Sunday night, April 21. · All preparations for the second Seder, including setting the table, must be done after nightfall, on Saturday night, April 20, after 8:24 PM. This includes lighting the Yom Tov candles for the second night of Yom Tov. Candles must be lit from a pre-existing flame. One should say a verbal Havdallah to formally end the first day of Yom Tov before preparing for the second seder by setting the table or cooking (again, from a pre-existing flame). The text to say is "Baruch Hamavdil bein Kodesh l'Kodesh, bless is the One who separates between the holy and the holy." This statement separates between the holiness of one day of Yom Tov and the next. 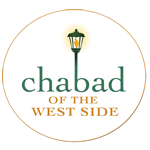 · The Chabad custom is not to wear Tefillin on Chol Hamoed. · For the simcha of Pesach, a glass of wine should be drunk every day of Pesach, including Chol Hamoed. · We must make an Eruv Tavshillin on Thursday afternoon, 4/25, Erev Shvi'i Shel Pesach (the eve of the 7th day of Pesach). This allows us to make all necessary preparations on Friday, Shvi'i Shel Pesach, 4/26, for Shabbat (Acharon Shel Pesach, the last day of Pesach) which follows immediately afterwards. However, unlike a regular Friday afternoon, it is important to make sure that all foods prepared for Shabbat be totally cooked and edible well before Shabbat begins. The Eruv consists of a matzah, and a cooked food, such as meat, fish, or an unpeeled hard-boiled egg. For details of the procedure and the appropriate Brachah that should be made, consult the siddur (Tehillat Hashem page 327) or see here. · It is customary to remain awake the entire night of Shevi’i Shel Pesach, Thursday night, April 25 and study Torah. · We don’t say Shehecheyanu in Kiddush on the eve of Shevi’i Shel Pesach or Acharon Shel Pesach (the 7th and 8th days of Pesach), April 25 & 26, nor when we light the candles on those days. · Chametz After Pesach - We are not allowed to consume any chametz owned by a Jew on Pesach. Be sure to buy chametz after Pesach from a store owned by non-Jews, or from Jews that have sold their Chametz. together with Moshiach in the Third Temple!